It’s well-known that Los Angeles touts itself as a cultural melting pot—a liberal Mecca with a thriving culture of art, music and film. It’s a place of sophistication and forward thinking, and where the only societal pressure is to be the hippest version of you. People are free to date whomever they like, and most onlookers won’t give a second glance. Having lived in the South where interracial dating is still taboo, LA is in direct opposite. I have had the pleasure of dating women of various ethnicities. What I look for in a woman has always been substance and depth. I’ve always been attracted to a woman who has something to say and isn’t afraid to say it. And in my life, these women have come in various tones and shades. However, like with anything, there is a less appealing side to what talk show host and radio personality, Wendy Williams, calls “the swirl”. On three occasions, I’ve dated women of European descent—most recently, German. She was a sweet, attractive and pleasant woman. Though we had our disagreements and ultimately a failure to sustain what we had, we ended things on honest terms. Yet, there was always an elephant in the room. She always seemed apprehensive to introduce me to her friends with the exception of her roommate. Once, as we sat in a Mexican restaurant near her hometown, a young white woman she recognized approached us. They greeted each other quickly and without introduction, the woman left and my date seemed relieved she didn’t stick around. I didn’t bother asking who it was, since it wasn’t my business, but it was strange. She would later explain she had no black friends, and limited friends of color. Out of curiosity, I once asked her, why that was? She didn’t really know, but she assumed she just spent time with people who were mostly like her. I found it odd. Living in a metropolis like Los Angeles, I had grown up with friends from all ethnic backgrounds, and I realized how much of a gift it was. I learned so much about other ethnicities and cultures. I learned to see the beauty of humanity; tolerance was imprinted into my upbringing. My parents had a diverse group of friends as well, and I remember as a child thinking that’s how friendship should be—a melting pot. In a later conversation, she explained she had dated black men before, but nothing serious had materialized. Her friends thought she simply had “the fever”, and that it was more of a phase she was going through since she could never stick it out with a man of color. She assured me that wasn’t the case; instead, she felt she could only see herself marrying a black man. Every now and then we’d have conversations concerning race and identity. She didn’t know much about black history, and rarely shared any tidbits about growing up German. We never attended cultural events in the city, or ventured into neighborhoods that predominately had an ethnic make-up other than white. She lived in the valley, and much of our time was spent there. Looking back, I realize there were times she was clearly uncomfortable. It made me wonder, was I that edgy accessory? Was I the equivalent of getting a tattoo or a piercing in an unexpected place? Was it a case of fetishization and rebellion? I remember in high school how certain girls from prominent white families would take a black boy to the prom. It was seldom that they would date them for longer than a month, but for the prom they were showcased in photos with the star black athlete—the award-winning wide receiver, the basketball playing MVP, the captain of the wrestling team. Sure, one could say girls just like athletes, but it was peculiar. I’m an eternal optimist and a racial deconstructionist. I believe racism will only be eliminated when great distinctions in color no longer exist—similar to what was broached in the National Geographic article, “Changing Faces: What Americans Will Look Like in 2050”. But I’m also a realist and understand the nature of people—some like to experiment, and LA is a great place to do it without facing judgment. However, there is something inherently racist in doing so. I faced moments where I felt less like a person and more like “the non-threatening black guy she was dating.” She once said, “From your voice on the phone, I’d never guess you were a black person.” This wasn’t so alarming since I’ve heard it all my life, and I’ve actually mastered sounding ambiguous on the phone—it’s helped me land job interview after job interview. Yet, it still bothered me. What is talking ‘black’? It’s a concept I’ve never gotten. I’m college educated with a master’s degree, so sue me. I read books, sometimes a book a week. Am I an anomaly? I don’t know, but I sure feel like one sometimes. It all boils down to cultural understanding and experience. I don’t think the girl I dated was a closet racist. On the contrary, I think she saw race in America as something that could be shelved and perhaps not really dealt with. After all, people can connect over music, films, food, books, etc. But there will always be that elephant in the room, and ignoring it doesn’t make it go away. I believe people should date others not because of their racial identities, but because they find them interesting. But if you are going to participate in “the swirl”, just be sure you’re dating someone who has a true interest in your culture. Since it’s a component to identity, someone who has no understanding or interest in learning about where you come from, may have an even less interest in really getting to know you on a deeper level. I’d like to think these issues are going away soon, but I think they are here to stay for a while. Misunderstandings and stereotypes are traps, and if they burrow their way into a relationship it will prove to be disastrous. More education is needed and an even greater willingness to expose our ignorance to each other, especially if love is at stake. For those participating in the black and white “swirl”, for your next date, skip the romantic comedy and check out “Dear White People”. It might be just the thing that lets that elephant out of the room. I recently saw David Fincher’s “Gone Girl” which resonated on a few levels. It’s a slick film based on the novel by Gillian Flynn, with an underlying metaphor about the futility of marriage. The female protagonist is Amy, a scorned woman who is also a psychopath. She constructs a revenge scenario of biblical proportions and sets out to make her husband suffer in unimaginable ways. The film treats marriage as some type of shared psychosis. It’s emotional but also very mental. What exactly happens to a person’s brain when they get married, or better yet, fall deeply in love? Things change upstairs–chemicals and neurons, an altered psychosis. Amy’s mission is to make her husband feel as bad as she did–worse. She recognizes that at some point, early on, she did love her husband but that love turns to hate upon discovering his infidelity. I understand that Amy is a murderous psychopath, but how she sees marriage may not be that far-fetched. Her philosophy is that when we meet someone and begin to build a relationship, we enter into a social contract. Who you say you are or pretend to be, is who we accept as the truth. It’s like both parties are agreeing to this lie or revision of who they both are–sure, things will come out later but they shouldn’t be earth-shaking shockers. Where the overall theme becomes apparent, is within the last 15 minutes that leads to the climax and resolution. Amy attempts to restore the contract she had with her husband and in the process she kills. She reclaims her marriage and renegotiates the terms of their agreement. This time with a trump card–pregnancy. The fear of Amy having a child and raising it is what propels her husband to stay. And their marriage becomes an even bigger production. Most marriages are just that–a production. There’s the public version, the private version, and then the version that exists in silence. It’s what isn’t said in the moments at the dinner table. There are people who have been married for years and quietly resent each other, but they don’t divorce. It’s that shared psychosis–a mental illness. Yes, Amy is insane but marriage isn’t for the sane. And they aren’t always about happiness for some. There are those who take comfort in knowing the devil they sleep with. Once you understand the nature of a thing, you know what it’s capable of. It can be much more frightening starting something new and having to get to know the ends and outs of that person. What if they’re worse than the person you left? What if they hurt you again and you can’t recover? These are frightening thoughts for most. In marriages people hurt each other–some hurt big, some small. Some go out of their way to hurt, and some just make horrible mistakes. Meeting someone sets unknown events into motion. It’s the unknown that we crave and that’s healthy. However, when venturing into the unknown, always be sure you can see a light at the end of the tunnel or at least a good exit route. It can be a frightening reality, that the people we love are strangers. We don’t always know they’re strangers but one day, maybe a month after meeting, six months, a year, ten years, you realized you didn’t really know the person you shared your life with. We humans, we dreamers, have a way of building people up–making them into something they’re not. People do it everyday, we revise people so they’re what we desire. Yet, it comes a time when you have to accept people for who and what they are. Sure, we want people to be their best because on some level we all aspire to be more. But we all get there at a different pace. Pushing someone to be something they’re not never works. It causes resentment and mental anguish. The real work should be spent knowing the person–who they really are. We should learn to listen more and talk less. Enjoy the moment and after all that, if the person still seems to be an enigma, there’s a reason. Some mysteries just aren’t meant to be solved. After some urging from friends, I recently joined the Tinder craze–yes, that app that links you with random strangers with the off-chance you’ll make some kind of connection that will propel you into romance, or just an easy ‘hook-up’. I thought the app was sleazy. And to an extent it is, it’s mostly used by call girls to sucker men into ordering their services. However, there are everyday women using the service too. I tried my hand at it–swiped a lot until I got a match. When I did, I viewed her profile. She was a grad student working on her MSW. We had things in common. She liked live music, beaches, and independent films. A conversation ensued. All day we talked off and on. It was nice. So nice we agreed not to spoil it by actually meeting. I think we both wanted to live the fantasy and knew that meeting would just deflate it; after all, who starts a relationship from meeting on an app? I know there’s a kind of loneliness out there, especially for my generation. We used to talk on the phone, now we text. We used to write letters, now we email. And we’re all desperately alone–looking to make a connection through social media or some app. I realize it’s like gambling–it’s like going to Vegas and betting on red or black. 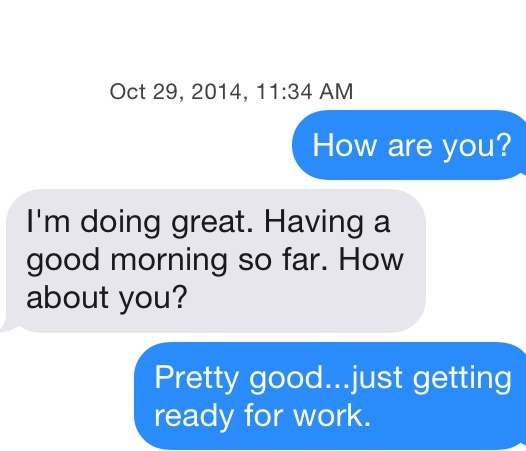 You swipe on Tinder, thinking will this be it? Will this be the one? You go to a bar dressed to impress some imaginary person you just know is there waiting to make your acquaintance. We’re all addicted to hope, to chance. Maybe it’s because we’re fed a heavy dose of romance. It’s practically shoved into our faces. Such and such met and fell in love on Match, eHarmony, OkCupid, etc. Do people even meet face-to-face anymore? I love romance. I think it still exists, somewhere. But I question if it exists in Los Angeles. I think Angelenos may have killed it. The bar and club culture in this city has people convinced that romance is a shared Uber to Mel’s Diner, and afterwards a dip in a hot tub. Los Angeles reinvents itself all the time, just like the people who inhabit it. You don’t like who you are one year, next year get a new job, new friends, new hobbies. In Los Angeles, you can pretend to be someone else. The trouble with that is when you do find someone worth your time, the role you’ve decided to play is the character they want. It’s who they fell in love with. You can’t just take the mask off and if you do, you run the risk of them not loving you. Masks make us forget who we really are–they’re dangerous. If people really want to find love in Los Angeles, they should start by figuring out who they are and what they want. Then they should give up on searching and live their lives–get some hobbies, meet new people, join clubs and groups they’ve always wanted to join. Stop fantasizing and live in reality.